Olive is one of the oldest fruits known to man. It is extensively used for extraction of oil from its fruits. This oil is edible, possessing valuable therapeutic character. About 92% of its produce is used for oil extraction. The main producers of olive oil are Spain, Italy, Greece, Turkey, Syria, Algiers, Morocco, Egypt, Tunisia and adjoining gulf countries. 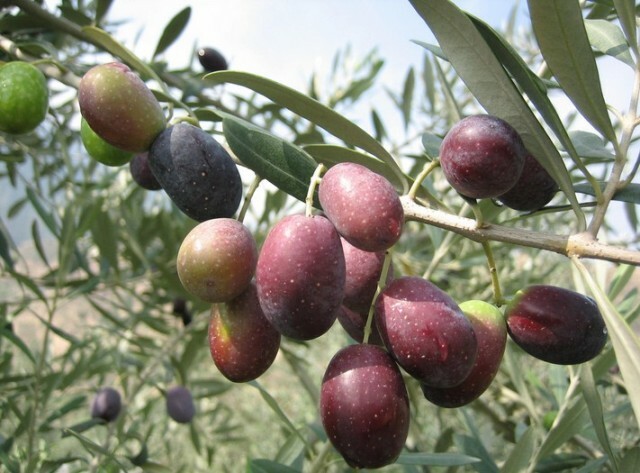 In India, olive cultivation has been undertaken on a limited scale in north Sub-Himalayan region comprising Jammu and Kashmir, Himachal Pradesh and Uttar Pradesh. Olive is grown in warm temperate to subtropical climate. In India, it can be planted from 800-1,400 m above mean sea-level. Temperature is the most important factor influencing its cultivation. Olive cultivation require a temperature range of 7-35 C, however 15-20 C ideal. Occurrence of prolonged hot and dry summers coupled with acute water stress cause post anthesis flower and fruit drop. Adequate chilling at 7-20 C during winter is essential to break rest period and to promote fruitfulness. Olive trees are not irrigated but they require 950 mm water during their entire growing season. A well distributed rainfall is conducive for growth of trees. Lack of adequate soil moisture due to prolonged drought during summers causes fruit drop. Inadequate or delay in rain during winter season delays emergence of new flush, causing a substantial reduction in flower bud differentiation. Occurrence of autumn frost is more harmful, since it affects fruit maturation and oil accumulation. Hailstorms at pre-bloom, bloom and post-bloom period causes higher abscission of flowers and young fruits. At blooming stage hailstorms render trees completely devoid of fruits, inducing alternate or irregular bearing in its trees. Although olive grows well in a wide variety of soils, it requires deep, fertile and well-drained soil for optimum growth and productivity. Loam and silt clay loam soils are well-suited fro its cultivation. Poor or calcareous soils are not suited for its cultivation. Soils 4-6 feet deep are well suited. The soil should be well drained to permit good aeration and extensive root development. The sub soil is, therefore, more important than upper layer of soil in ensuring better growth and productivity of its trees. On the contrary, olive trees do not tolerate wet soils for a prolonged period, since it results in eventual death of its roots. Soil pH of 6.5 -7.5 is ideal. However a pH exceeding 8.5 adversely affects its growth and productivity. Its trees can tolerate a fairly high amount of Ca and B.
Ascolanaterena: Trees very vigorous, upright and compact; inflorescence short, sparse; fruits spheroidal, black with rounded open and slightly asymmetric. Yield moderate to heavy. Resistant to cold and Cycloconium-knot. 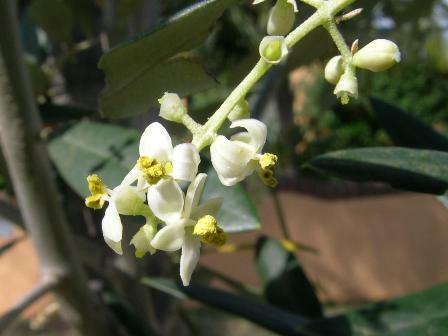 Ascolano: Trees vigorous; inflorescence short and sparse; yield moderate to high. Fruits spheroidal, large-sized but slightly asymmetric, turn black on ripening stones large. Resistant to Cycloconium-knot and cold but susceptible to olive fly. Pulp: stone ratio quite high and oil content 22-24 %. It is suitable for pickling. Canino: Trees moderately vigouous and spreading; self fruitful and regular –bearer, inflorescence short, and paniculate; fruits small sized, elliptic with pointed apex- yield moderate resistant to drought. Carolea: Trees upright, moderately vigorous, inflorescence racemose, but short and compact; fruits asymmetric, bright black, spheroidal, and large size. Yield good, oil content 20-21%/. Resistant to cold, drought and frost but susceptible to Cycloconium –knot and olive fly. Cortina: Trees moderately vigorous inflorescence short and compact; fruits large-sized, oval and slightly asymmetric; late ripening; heavy-yielder with 23-25% oil content. Stones medium sized. Resistant to drought and cold but susceptible to olive knot, olive fly and peacock eye. It is suitable for pickling. Frontoio: Trees moderately vigorous inflorescence large and sparse; fruits medium, purple –black and oval –elongated. Ripen late, oil content 23-25% yield high and consistent. Stones large sized. Susceptible to cold, Cycloconium-knot and olive fly. Leccino: Trees vigorous; inflorescence short and sparse; fruits medium sized and purple-black, spheroidal with rounded apex; stoen: pulp ratio medium; yield medium and consistent; oil content 25-30%. Resistant to low temperature but susceptible to sooty-mould and Cyclocomium- knot and cold. Pendolino: Trees moderately vigorous; inflorescence large and compact; fruits medium-sized, oval, and asymmetric with rounded apex, black color at maturity. High yielder, oil content 23-24 %. Stones medium sized, spheroidal with smooth surface. Susceptible to Cycloconium knot and cold. Olive can be propagated by seeds and cuttings. The partially ripe fruits are collected during September-October. The stones are separated from their pulp by dipping them in caustic soda containing 10% Na OH or KOH in a dilute HCI. The stones are thoroughly wasted in running water to remove all traces of chemicals. They are immediately sown in raised nursery beds at a spacing of 15 cm from row-to –row and 5cm from seed-to –seed. The nursery beds are mulched and regularly irrigated. The seeds germinate with the onset of spring season. However, a few seeds germinate 1-2 years after sowing. Propagation by cuttings is a simple method. The plants raised by this method are uniform in their growth and productivity. Leafy, sub-terminal cuttings 12-15 cm long of pencil thickness having 3-4 nodes each are taken from the mother tree. The cuttings are wounded at their base and kept moist until their pre-treatment with 500ppm NAA+3,000 ppm IBA for 10 seconds. The cuttings are then planted in a mist chamber under controlled environment. The optimum temperature for rooting is 22-25+ 1`C with 70% relative humidity. The roots emerge 6-8 weeks after planting. The rooted cuttings are taken out from the mist chamber 10-12 weeks after their planting and kept fro a short period in hardening chamber. The rooting medium of puresand or vermiculite can be used. Then these are transplanted on nursery-beds. Planting time varies from cultivar to cultivar. Olive aswiterana roots well in March, whereas those of Frontoio, Coratina, pendulino and Cornicobra during June-end. The cuttings of Aglandeau give maximum rooting (>80%) in January. Olive seedlings can be conveniently grafted by veneer or cleft or tongue grafting. March-April is optimum time for grafting. Of different methods, i-budding and patch budding are most effective. Seedlings of wild olive can be used as rootstock for propagating commercial cultivars. The planting distance depends upon region, soil type, its fertility, cultural practices, availability of irrigation, and vigour of scion and stock. In deep, fertile soils having assured irrigation facilities olive trees should be planted eight meter apart. If semi- dwarf rootstocks are used planting should be done 6-7 meter apart. The planting density should be 150 trees/ ha, when planted eight meter apart, whereas it should be 250- 300 trees / ha with a planting distance of 6-7 m. In a rectangular plantation, a planting distance of 8 m x 5m or 6m x 5m corresponding to a planting density of 250 and 333 trees / ha, can also be used. In irrigated areas, January- February is ideal planting time. But areas which are prone to prolonged periods of drought during summers with a negligible or no irrigation facility, July –August is ideal to plant olives. In areas experiencing heavy monsoon rains, planting should be delayed. An efficient drainage system is a prerequisite in water logged areas since olive plants are too sensitive to such conditions. In poor soils, pits of 90 cm x 90 cm size could be dug, whereas in good, rich and loamy soils, 60 cm x 60cm size is adequate. The pits should be dug up at least two months before planting. The sub soil should be well mixed with farmyard manure and super phosphate. The pits should first be filled with a mixture of soil and fertilizers and then with top soil. The trees should be planted 2-5 cm deeper than they were in the nursery. In sandy or dry soils, it is desirable to plant them still deeper. While planting, care should be taken that graft union is kept about 25 cm above the ground level. All broken, injured or rotten roots must be trimmed before planting. The earthball containing plant roots should be soaked in 1% copper sulphate before planting. In feathered plants, stronger scaffold limbs should be trained to keep the plant straight. Ensure a minimum disturbance to root system of the plant while transplanting. There are several planting systems used for orchard layout but selection of a suitable system of planting depends upon topography of the land, cultivars, and rootstock used, soil management system and intended method of harvesting. However, square, rectangular, triangular, contour and hedgerow systems are adopted for planting olive trees. At the time of planting, a support system of about 10 feet should be erected. In a feathered tree, develop a clean stem to a height of 45 cm from the ground and select one branch each to the left and right which can be tied to lowermost wire. Remove weak laterals. In the second growing season, develop another set of scaffolds on the next higher wire and repeat the process. Eliminate all other undesirable scaffold branches. In third growing season, another pair of lateral scaffold branches is developed to the next higher wire. The secondary scaffold branches are allowed to develop on main scaffold branches but if they become over vigorous, they should be headed back. All upright growing shoots which either compete with the leader branch or arise from main scaffold limbs are eliminated soon after their emergence. When tree attains a height of four m, it is headed back to a weak lateral. The intensity of pruning in later years is kept minimum until tree attains bearing age. 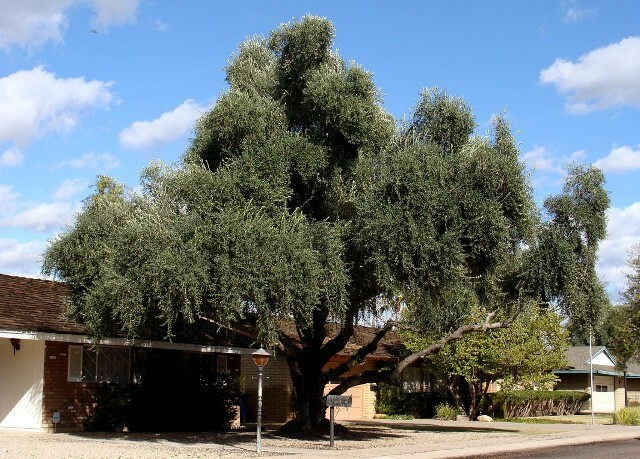 Young non bearing trees can be pruned any time of the year if weather is clear and free from intermittent rains. However, pruning of trees should be avoided when prolonged drought period coupled with acute water stress prevails. In bearing trees, pruning should always be carried out immediately after harvesting to encourage new growth for initiating floral buds for the next season. The intensity of pruning depends upon vigour of cultivar, age of tree, availability of irrigation, and bearing behavior of the tree. During transitional phase, only light pruning is adopted but as the tree becomes older, the intensity of pruning is to the increased accordingly. In old trees, rejuvenating type of pruning is required which involves heading back of main scaffold limbs to encourage new vigorous shoots which begin fruiting after two years. In young plants, only corrective pruning should be done as and when necessary. Pruning during initial 2-3 years is not advisable. However, occasional removal of water sprouts, dead or mechanically injured braches should be carried out regularly. A clean trunk devoid of any feather should be developed up to a height of 40cm above the ground. The higher intensity of pruning during initial years stimulates strong vegetative growth. The pruning wounds should be immediately disinfected with boardeaux paint. This minimizes the chances of various pathogens entering into the plants and also hastens the process of healing. A comprehensive knowledge about the nutritional requirement of olives is essential to provide them a balanced nutrition and to maintain and equilibrium between their growth and productivity. This becomes more important when olive trees are grown on poor soils under rain fed conditions. The recommended doses of different manures and fertilizers for olive trees are given in Table 1. Note: In bearing trees, apply Borax (200g/tree) once in alternate years. The whole quantity of phosphatic and potassic fertilizers should be applied along with farmyard manure and Borax during October-November in irrigated areas, but in rain fed areas at the onset of the winter rains. The N should be applied in three split doses. Half dose of N should be applied immediately after harvesting or with the onset of the winter rains in December; one fourth during February—March eight weeks before flowering and remaining one fourth during June –July with the onset of monsoon rains. The farmyard manure along with nitrogenous fertilizer is evenly broadcast in the drip area of the tree. It should be mixed with top soil. But phosphatic and potassic fertilizers along with Borax should be applied in a trench 15 cm wide and deep in the drip area of the tree. The trees should be irrigated after fertilizer application. Young plants should be well maintained by controlling weeds judiciously. They should be regularly irrigated, whenever necessary. Adequate moisture conservation and drainage measures should be undertaken. Fro 6 months old trees in irrigated areas, apply 10-20 g calcium ammonium nitrate at monthly intervals along with irrigation. These plants should also be protected from various insect pests. Nitrogenous fertilizer should not be applied to newly planted saplings until they are 6-8 months old. Trees must be tied to the stake in such a way that it stands firmly without chopping or rubbing against the stake. In the first one or two years, a soft gunny thread (sutli) should be used. Afterwards a strong rope even of nylon can be used. It is advisable to use a piece of gunny bag on the stem of the plant before tying it with a strong rope. The knot should be loose enough to enable the trunk to thicken. These ropes should be readjusted at least once a year. All undesirable suckers should invariably be removed. However, under exceptional circumstances, only well placed suckers which do not interfere with the framework of the tree can be retained whereas the remaining ones are eliminated. If a situation of profuse suckering is confronted then stubs of eliminated suckers be treated with 1% NAA in Lanolin paste to suppress the emergence of new suckers. Mulching is very effective to conserve moisture and lower evaporation losses trolled effectively. Controlling them manually is most expensive. Therefore spraying of appropriate weedicides is quite effective control measure. Apply Glyphosate @ 0.18-0.36 kg/ha depending on weed intensity. Repeat the spray 2-3 times during entire growing season. Simazine +Diuron (2 kg/ha) may be used to control grasses. The application of Gramaxone (2-3 liters/ ha) is effective to control perennial weeds. 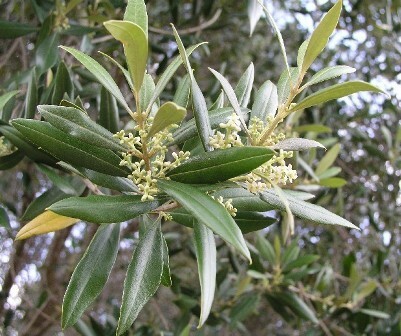 Mature olive trees require 950 mm water during March-September. Although its trees are seldom irrigated, deficit irrigation practices cause a marked reduction in fruit quality and yield. It is, therefore, imperative to maintain optimum levels of soil mixture throughout the growing season which in turn ensures adequate tree growth and economical yield. The time of irrigation should coincide with the period of water stress in the area. The olive trees have certain critical periods when adequate supply of water is needed to keep equilibrium between growth and productivity of trees. It is necessary to apply one irrigation four weeks prior to the expected time of flowering. This ensures adequate development of flower and lowers down flower bud/ flower abscission. The trees should be irrigated after two weeks of their peak blooming period. This improves the fruit set. One irrigation a month after fruit set stimulates development of young fruits, and reduces their drop / abscission. There are two well defined classes of fruit utilization—table olives and mill olives. Mill olives contain more oil, and less sugar and water than table olives. Early harvesting or firm but an immature olive decreases both quality and quantity. Delay in harvesting produces oil of higher acidity. Oil extracted from over ripe fruits is susceptible to all type of damages and deteriorates rapidly during postharvest period. Some varieties develop a higher acidity and undesirable sensory characters in oil obtained from over ripe fruits. The olive should be harvested when oil with a good quality and pleasant aroma is obtained without much bitterness. In pickle cultivars, relative changes in fruit firmness, color and degree of bitterness of the oil obtained 25 weeks after flowering show a gradual decline in bitterness of the oil and a minimal value of bitterness in oil coincides with a strong change in color corresponding to purple black color/ stage. This happens 29 and 30 weeks after flowering. It can, therefore, be considered as a point at which the best oil quality can be obtained. Furthermore, the fruits at this stage suffer less damage during postharvest handling. Hand picking is the most suitable method of obtaining high quality oil a it preserves fruit integrity. It is and expensive and a slow method, so it is economically impossible to collect all the fruits at optimum maturity. This leads to indirect losses in oil quality owing to either the increased quantity of immature fruits or an increase in the proportion f over ripe fruits if harvesting is either advanced or delayed. Therefore, there is a need to use mechanical or chemical methods to reduce harvest costs and to improve the quality of oil. The greatest deterioration of olives takes place between harvesting and processing. In these conditions, all kinds of degenerative and pathogenic infections develop in the fruit. Aerobic agents also act in the innermost zone of the pile and there is a marked increase in temperature or this zone which accelerates fruit degradation. Aerobic organisms also act in the outermost areas of the heap/ pile and oil obtained from these fruits is characterized by a high acidity produced by lipases of both olive and parasitic origin.